The new app appears to be inspired by the popularity of text messaging, which Pew Research reported last year to be the most popular feature among smartphone users, ahead of internet browsing, voice or video calling, email, or video and music consumption. 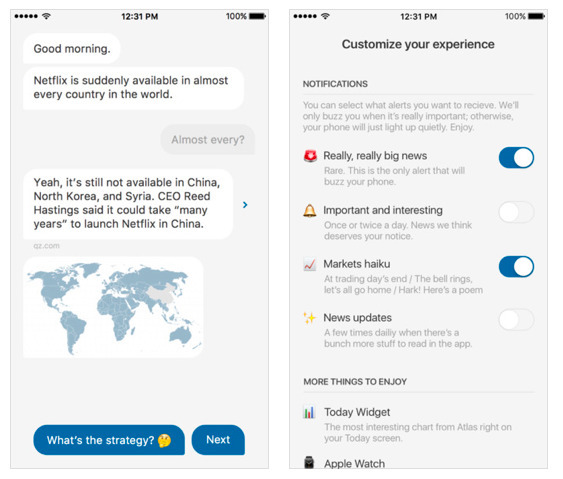 The new app presents a news feed that looks like Apple's iOS iMessages, with incoming news, graphics and video clips appearing as received messages. Users can "reply" by picking one of a couple canned responses, which appear as blue bubbles. User responses direct the flow of curated news segments, allowing the service to expand upon a given subject, or alternatively move on to something new. News bubbles also offer links to full stories or related content. Also akin to Apple's Messages app: the curated news feed is embellished with emoji and GIFs, and indicates new messages are about to be received using the same chat bubble with an animated ellipsis. It's also driven by notifications, which the user can customize to being rare major events, once or twice a day, or frequent updates throughout the day. In addition to the main iPhone app, Quartz also supplies a Today Widget for iOS, and an app for Apple Watch (above), customized to deliver incoming news updates at a glance, including a "market haiku" summarizing the prevailing business climate. The Apple Watch app also features a Complication which reflects the stock market's direction on the user's watch face via an emoji. An equivalent app for Android is still under wraps, despite the broad distribution of that platform. Android's installed base in the U.S. is similar to Apple's iOS devices, but much larger than Apple Watch. However, for a number of reasons iOS and Apple Watch remain a priority for developers building innovative new app experiences.